Roving was developed by RoviSys, an Automation and Information Solutions provider with a 25 year history of engineering expertise. As a rapidly growing company, RoviSys needed to manage real estate cost while accommodating an expanding staff. Construction appeared to be the best alternative, and a second building at the Aurora, Ohio campus was completed in 2012. Six months later employees were still searching for available workspace. It seemed impossible that the new space was already full, so the search for an alternative began. Despite the feeling of being at capacity, a simple tour around both Ohio buildings quickly revealed that only 70% of desk space and common space was being utilized. Employees were working at customer sites, attending client meetings, traveling to sales calls or on vacation. The question became obvious: why build another building when 30% of the existing spaces were unused? The answer was Roving. An office management solution designed to easily manage office space needs and shared resources. Roving evolved as a scalable hoteling solution that allows employees to reserve offices and conference rooms, share calendars and quickly locate other people. Asset inventory reservation evolved shortly thereafter. Roving has allowed RoviSys staff to expand by 88 employees over the course of one year, without adding any actual offices or desks. It has been quickly adopted by staff as an effective solution for reserving space, locating employees and equipment reservations in offices in Singapore, Raleigh, Luxemburg, Boston, and Aurora. It’s proven success has fueled requests for new features like Outlook calendar integration. 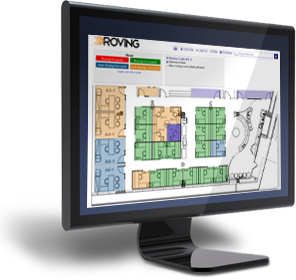 As the first fully integrated user of Roving, RoviSys has realized significant savings, streamlined office spaces and created an office culture that is flexible and friendly. No training program was needed thanks to the intuitive user interface. Shortage of desks and conference rooms is no longer a problem, with empty seats available for any employee who is "Roving". Similar scenarios of expansion and space utilization are common across many industries. Learn more about getting more out of your existing office space. RoviSys is proof that it works!